TCU getting annihilated by Oklahoma in the Big 12 title game probably knocked the Horned Frogs out of a New Year's Six bowl. Three years ago, the Big 12 was left out of the inaugural College Football Playoff when it was determined by the selection committee that the conference’s co-champions, Baylor and TCU, were not worthy of one of the four playoff spots. Ohio State managed to get in with the fourth and final seed, and the argument quickly centered on the Big 12’s lack of a conference championship game potentially hurting the conference’s chances of getting a team in the playoff field. Nothing could have been further from the truth, as proven the following season when Oklahoma reached the playoff. Still, there were some who felt if the Big 12 was going to be on even ground with the other power conferences, then it needed to bring back the Big 12 championship game. They did this season, although the only reason for it was for the sponsorship and advertising revenue that comes with it. The 13th data point did nothing but harm the Big 12’s chances of filling out spaces in the New Year’s Six lineup this season. On the one sideline was Oklahoma. The Sooners were ranked third by the College Football Playoff selection committee coming into conference championship week. 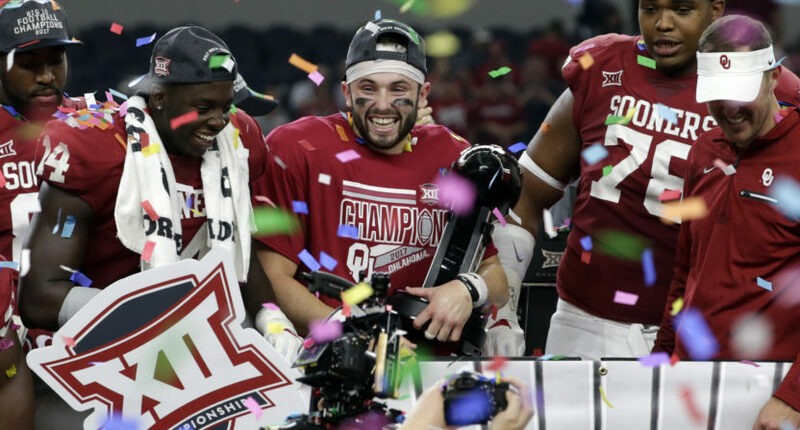 In either of the past couple of seasons, Oklahoma would be in solid position to take one of the four playoff spots, but this year Heisman Trophy frontrunner Baker Mayfield and Oklahoma were forced to beat a TCU team they already defeated this season in order to prove themselves worthy of playoff consideration. When a conference plays a full round-robin schedule, there is no need to settle the score on the field, but the mess of the Big 12 being reluctant to embrace and honor their one true champion mantra from 2014 was ridiculed too much so something had to be done. Fortunately for Oklahoma, they secured their spot in the playoff with a 41-17 victory featuring four touchdowns from Mayfield. But that brings us to how the Big 12 just screwed itself at its own expense because it felt it needed to have a conference championship game. Oklahoma’s blowout of TCU may have dropped the rest of the Big 12 out of the running for one of the remaining at-large bids to play in a New Year’s Six game. The Horned Frogs were ranked No. 11 coming into the conference championship game. A 24-point loss to Oklahoma likely means TCU will be falling a few spots in the rankings. They’ll probably take a deeper hit than No. 12 Stanford, who lost to No. 10 USC by three in the Pac-12 championship game. As a result, No. 13 Washington could slide into the New Year’s Six mix for an at-large bid that could have been locked up by TCU if not for the Big 12 championship game. There are six New Year’s Six bowl games with 12 spots to fill. Four will be going to the playoff teams. One more is going to UCF as the top-ranked Group of Five conference champion. USC as the Pac-12 champion has to go somewhere since they will not be in the playoff. And TCU isn’t getting a playoff spot, so that’s six spots filled already. Ohio State as a Big Ten champion potentially being left out of the playoff means they have to go somewhere as well. The Orange Bowl is reserved for an ACC team (Miami?) and the highest-ranked team from the Big Ten, SEC, or Notre Dame (Alabama or Auburn). We are running out of space for TCU very quickly, and I am just now getting to No. 9 Penn State that was already sitting in front of TCU before the weekend started. They are going to fill one of the NY6 spots as well. Had TCU lost a close game to the Sooners, it is likely nothing would have changed with the Big 12’s outlook in the New Year’s Six. But a blowout loss? That is a serious blow to the Big 12’s bowl outlook, and that in itself will result in a bit of a hit in the bowl revenue shares are distributed. But at least the Big 12 had that championship game to make up for the bowl revenue loss, right? There is a certain bit of irony that the ramifications of having or not having a conference championship game in two separate seasons centers around TCU getting the raw end of the deal.